The area around Centre de Pompidou at 8PM was like the movie version of Paris in spring: young people relaxing on the hilltop slope in golden hour light, eating ice cream and chatting to the sound of pigeons coming home to roost and flying overhead. And if you visit around then, you might see the pigeon man. Wizened and hunchbacked, he appeared like clockwork both days we were there, in a grey down coat and carrying a small shopping trolley, a faded walking stick. The pigeons went wild, fluttering down in unbelievable numbers until you could not ignore the pandemonium. I inched closer and saw the plastic bags - four or five and heaping full of bird food that he scattered by the fistful, looking completely unbothered by the frenzy of flapping wings and piegons coming to perch on his head and back before flying off. Chaos, and bird calls, and then it was over. 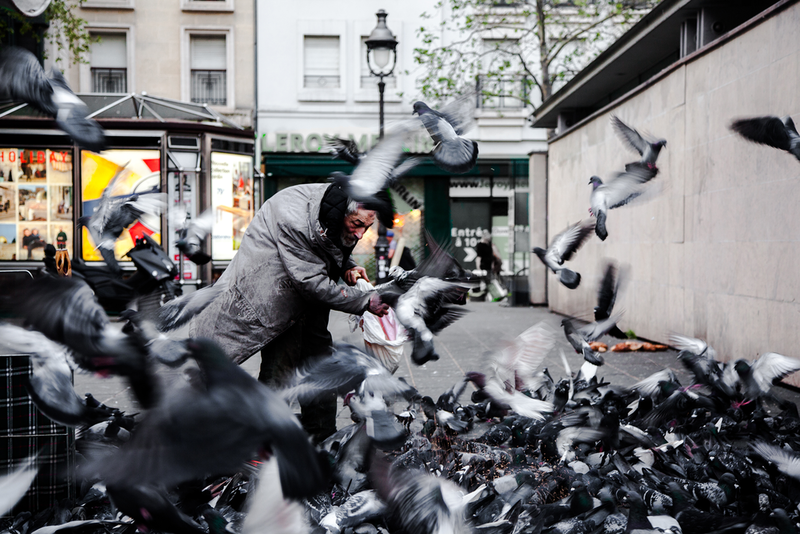 I call him the pigeon man and wish I could tell you his name. I read once that some tribes in Africa and South America believed if you took someone's picture, you would also steal their soul. Seeing him in the centre of pigeon pandemonium, surrounded by tourists with their phones and cameras out, I felt guilty and complicit in the act of doing just that. He was not some zoo animal to be gawked at and made into a spectacle, collected for personal recollection and dismissed as soon as the feeding session ended. Part of me desperately wanted to go up to him and speak to him, ask him his story. But - like everyone else - I kept my distance. It may have been my lack of French, his surly, insular and slightly unkempt manner that suggested he might wave me away impatiently or the worry I would be disrespectful, but it was also just fear in general. These are the little travel moment discomforts where you're at the edge of your comfort zone but don't choose to cross the line, and I'll always be left wondering a little about what might've happened if I did. The issue of respect is also a really interesting one - I'm not insensible to the fact that barging in cheerfully and intrusively demanding some sort of Eat Pray Love story from a stranger may actually be more disrespectful and 'entitled tourist' than leaving someone to their personal space and not bothering them. But without taking the risk to speak to him and ask, I will never know. By the time I finished wrestling with all this, the moment was gone and he was gone. What I do remember is the sheer wonder of seeing the sight and the striking, frantic beauty of it all. 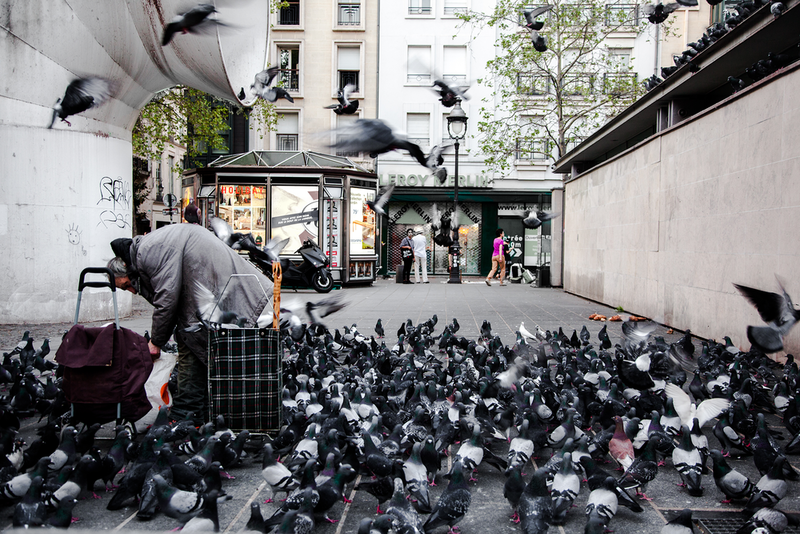 I love birds and always found it sad how pigeons are given a bad reputation: city rats, dirty, disgusting... but in Paris, I learned there was someone who cared for them. I didn't even notice I actually had my shutter speed set a little low until it was all over. But a lucky happenstance, I think: all birds in flight are beautiful creatures. It's poor compensation for an actual conversation and portrait, but I hope these photos capture a little bit of what it felt like to be looking on.